Congrats to him. His 2nd test century, and his first at home. 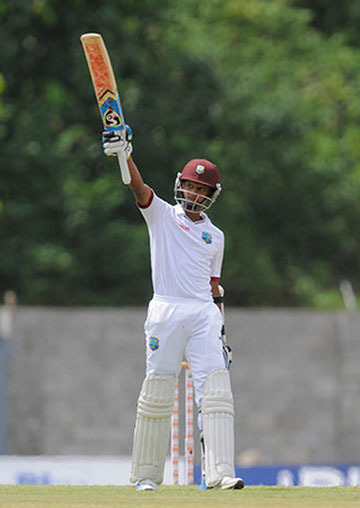 The 1st Windies keeper to score a century against Sri Lanka..
Lakmal has been very impressive with the ball. Sri Lanka ends day two with 31/3. Holder was lucky with that no ball not being called. From 145 for 5, the hosts dragged themselves to 414 for 8 - a score Jason Holder felt comfortable enough to declare on. Then their quicks brought the fire. In the 10 overs they had at Sri Lanka before stumps, they had the batsmen jiving and jerking - Shannon Gabriel consistently breaching the 140kph mark. They were rewarded with three wickets, and consequently, a firm grip on this match. So proud of the fight from the boys. Rally, rally round the West Indies. Now and forever. Indeed. Excellent heartwarming performance by the lower middle order and then great pace bowling. Gabriel striking at the stroke of lunch was big. Momentum. And it was Chandimal who was dismissed. Sri Lanka have to bat out of their skins to make a comeback. Maybe 40 year old uncle Herath and dickwella can do it. Very casual running between the wickets from Dickwella costs him his wicket. Gone for 31. Excellent fielding from Kraigg. Direct hit. Got to say, loved the way we cleaned up SL's batting in the day. Then with a healthy lead, adding to it. That gave Kieran Powell a license to play his natural game. In the process he got some runs under his belt, and took his team's lead close to 400. With two days left, a declaration might come some time after lunch on day 4. Gabriel looks doubtful to bowl in the second innings. 453 is the target for Sri Lanka. Part of me feels that SL will chase down this target. Gabriels strikes; and it's the centurion Kusal Mendis. A bg blow. Captain Chandimal comes back to resume his innings. 6 down. 4 more wickets to go. 3 more wickets for victory. Come on you West Indies! Good win by the boys. Crushing victory by the Windies. Sri Lanka have lost Angelo Mathews midway through their West Indies tour, after he left for home due to personal reasons. The news gets worse for the team: fast bowler Lahiru Gamage has been ruled out of the tour as well, thanks to a fractured finger sustained on the final day of the first Test. Hetmyer misses out yet again as Windies are sticking with the same eleven.